To Book or For More Details on these Australasian Offers? Go from desert to swamp, rainforest to glaciers and every conceivable corner of Australasia in between with Travel 2 and Etihad Airways. With 78 new properties and 56 new tours across AUS, NZ and the South Pacific, our 2018/19 brochure is filled to the brim with more options than ever before. Meanwhile, Etihad makes flying long-haul a pleasure - whichever cabin class your clients choose, they will experience unrivalled comfort and service, plus an impressive range of enhancement options to personalise their travel experience further. A year-round traveller’s paradise, visiting New Zealand feels like stepping into a dream world built from some of the most amazing countries on the planet. A small country with a big heart, there are many things that make New Zealand truly unmissable, including its unique history, vibrant culture, world-class food and wine and beautiful natural scenery, there’s so much for your clients to do – so let them find their story! 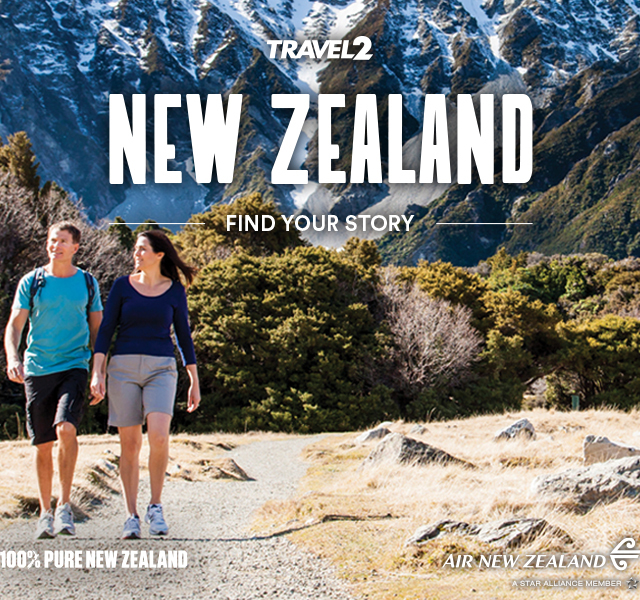 Get your trip off to a flying start with New Zealand’s national carrier, Air New Zealand. The award-winning airline has earned a global reputation for its innovation and Kiwi hospitality and as they fly some of the world’s longest routes, there’s not much Air New Zealand doesn’t know about long-haul travel. You can sit back, relax and experience New Zealand from the moment they step onboard with fantastic New Zealand wine, fresh Kiwi cuisine and warm and friendly service. With products like the innovative Economy Skycouch™ and the luxurious Business Premier™ lie-flat bed, your clients will see why Air New Zealand truly is a better way to fly. Stunning coastlines and crystal-clear lakes await exploration on this fabulous New Zealand road trip. Beginning and ending in Auckland, this self-drive campervan holiday will take you from the striking scenery of the Coromandel Peninsula to the other worldly geysers of Rotorua and boiling mud-pools of Lake Taupo. Discover the charming and beautifully preserved Art Deco town of Napier before soaking up the stunning vineyards of Hawke’s Bay. From Auckland to Christchurch, drive across the spectacular landscapes of New Zealand on the routes less travelled. Explore the diversity of Auckland before driving to Rotorua to breathe in the Maori culture. From Tongariro National Park to the capital of Wellington, you’ll course the most beautiful river in North Island, Whanganui River. Te Papa Museum is worth a visit in Wellington before heading south. From the thermal pools of Hammer Springs to Lake Tekapo, you’ll be enchanted by the stunning vistas on the remote passes and mountain roads traversing the island. In Queenstown there are plenty of activities to choose from before moving on to the sweeping glaciers of Franz Josef. Experience the best of Christchurch by vintage tram and glide along the River Avon enjoying the iconic Punting Tour. Uncover this unique city’s rich heritage, stunning gardens and beaches before boarding the iconic TranzAlpine train for an epic journey across the Southern Alps to Greymouth. Journey to the resort town of Wanaka, set against a backdrop of snow-capped mountains, then arrive in bustling Queenstown. Enjoy a Milford Sound nature cruise from Te Anau and then travel onto Dunedin to explore, where you will also enjoy a Speights Brewery tour before heading for your homeward flight from Christchurch. From Auckland, drive across the spectacular landscapes of New Zealand. Explore the diversity of Auckland, perhaps, take part in the amazing Auckland bridge climb, before enjoying the Corromandel day tour. The Weta Workshop will wow you and Te Papa Museum is definitely worth a visit in Wellington before heading south - you’ll be enchanted by what this region has to offer. In Queenstown, enjoy a skyline Gondola ride with dinner, then conclude your epic adventure in Christchurch, with the Arthurs Pass farm tour. Kick-starting in Auckland, this incredible tour takes you on a voyage around the wondrous Bay of Islands, an unmissable highlight that’s known for its stunning beauty and history. You’ll then continue to the famous Waitomo Caves, where you will witness the underground limestone caverns, lit by thousands of tiny glow worms. From here you’ll journey on to the geothermal wonderland of Rotorua, visit cosmopolitan Wellington and sail through to the Cook Strait. Cruise the stunning Milford Sound, visit the historic city of Dunedin and gaze across the breathtaking views of Mount Cook, New Zealand’s highest mountain. Debut your New Zealand adventure in Christchurch before taking in the panoramic views from across Lake Tekapo and Mount Cook National Park. From Dunedin to Milford Sound, you’ll experience gorgeous natural wonders including rainforests and ancient glaciers. Explore the famous glow worm caves at Te Anau, before heading north to Franz Josef Glacier and New Zealand’s vibrant capital, Wellington. From here you’ll spend time in the rural areas of the North Island, before finishing in the relaxing Bay of Islands and Auckland. Discover Australia, a sun baked land home to some of the world’s most wonderful wildlife, gorgeous coastlines and fantastic food and wine experiences. Visitors are welcomed by friendly locals, who love to share insider tips about the best beaches, coastal cafes, hip restaurants, favourite walking trails and secret surf spots. Don’t fall in to the trap of thinking you need at least a month to ‘do’ Australia, because in as little as two weeks you can enjoy an amazing Aussie holiday – equating to a lifetime of memories. So, what are you waiting for? Create your perfect Australian holiday today! Your adventure will begin in one of Australia’s stunning cities, each with their own personality but united by their vibrant food scene, quirky bars, interesting visitor attractions, exciting events calendars and proximity to gorgeous beaches. New South Wales has endless unspoilt beaches reaching for miles and is home to one of the world’s most famous and vibrant cities, while The Northern Territory is teeming with spellbinding national parks and tropical charms. With the bright lights of the Gold Coast and the technicolour underwater world of the Great Barrier Reef, Queensland has a piece of paradise to suit every traveller, whereas South Australia, with its rugged red Outback, dramatic coastline, world-class vineyards, local produce and historic towns and cities, certainly packs a punch. Victoria offers a host of spectacular coastal, cultural, and wildlife experiences within an easy drive of sophisticated Melbourne and its hidden gems, contrasted with Australia's biggest state, Western Australia, which is best known for its spectacular landscapes and creative gastronomy. Finally, as intimate as it is beautiful, Tasmania is home to vast wilderness, spectacular mountains and the freshest food and wine imaginable. Pick up your home on wheels and begin your journey down Australia’s stunning east coast from bustling Brisbane. Byron Bay is not to be missed, filled with boutique stores, bars and luxury beach resorts. Perhaps visit Port Stephens, where plenty of adventure activities including sand dune quad bike safaris, sand boarding tours, skydiving, and paintball await your arrival! Hunter Valley is not just a stop for wine lovers, it’s a place to sample local produce, get lost in the beautiful Australian countryside, or relax and unwind. Conclude your journey in cosmopolitan Sydney, making times for its stunning landmarks, including the Sydney Opera House. It’s time to explore the exciting landmarks that make up Eastern Australia. Visit the cosmopolitan city of Melbourne which is home to great food, shopping and history in its hidden laneways. Take a flight to the Northern Queensland city of Cairns for some unbeatable cultural and natural experiences. See the World Heritage listed Great Barrier Reef and learn about the Indigenous people of the rainforest before travelling to Sydney to see the iconic sights, including a walk beneath the famous sails of Sydney Opera House and Bondi Beach. A scenic 10 day adventure beginning and ending in Launceston, this tour explores the beautiful scenery, great wildlife and breathtaking national parks of this fascinating state. From cruises along the Gordon River to visits to Cradle Mountain, sightseeing in Hobart and sampling Tasmania’s local cuisine, this exciting trip offers a great opportunity to experience a wealth of interesting destinations that are off the beaten track, a guaranteed unforgettable trip. Spend some time in vibrant Darwin and enjoy this gateway to the unique wildlife and tropical habitats of the Top End, before setting off on the iconic Ghan Expedition train journey. Enjoy a cruise through the idyllic Nitmulik Gorge and dine in the outback beneath the stars in Alice Springs. Explore the opal mining capital of the world, Coober Pedy, before unwinding from this epic expedition in the cosmopolitan coastal city of Adelaide. Enjoy Australia’s great food and wine road trip! The Epicurean Way seamlessly links together the four iconic wine regions of McLaren Vale, Adelaide Hills, Barossa and Clare Valley in a journey not available anywhere else in Australia. Sumptuous local produce, together with a superb array of wines and spectacular scenery all come together as you drive through the Epicurean Way, a perfect trip for those who travel for their taste buds. Cruise back in time to the Victorian goldrush of the 1850s at Sovereign Hill on this Self Drive tour. Explore the beautiful boutiques, cafes and markets of Mornington Peninsula, and view the native wildlife of Phillip Island and Wilsons Promontory National Park. A highlight of any visit to this part of Australia is a trip to see the little penguins emerge from the sea at dusk to take shelter in the shoreline for the night. Indulge your palate with some of the best wines and fresh produce in Yarra Valley, specialising in cool climate wines such as Chardonnay and Pinot Noir and a variety of top quality local produce, you’ll be spoiled for choice! Explore vibrant Sydney with its iconic Harbour Bridge and Opera House before travelling north to Port Macquarie and taking in the relaxed vibe of Byron Bay. Visit Australia Zoo on your way through to tranquil and glamorous Noosa and explore the sand dunes of Fraser Island in a 4WD vehicle. Keep heading north to Hamilton Island where you get to experience Island life at its best, and travel through the rainforest on your way to Cairns for a cruise on the beautiful Great Barrier Reef. Experience the many highlights of iconic Australia on this Essential tour. Wrapped around a stunning harbour, Sydney is home to the instantly recognisable Opera House and Harbour Bridge - which can be climbed for an unbeatable view. Enjoy some rest and relaxation on the jewel of the Whitsundays, Hamilton Island. Experience the colourful coral and marine life of the Great Barrier Reef from the beautiful coastal town of Port Douglas, where the opportunity to snorkel is not to be passed up. Learn of the cultural and historical significance of the Red Centre's most famous sight Uluru from the traditional owners of the land before continuing on to trendy, cosmopolitan Melbourne. Here you can explore Queen Victoria Market and enjoy an included lunch on the Colonial Tramcar Restaurant – a unique modern Australian dining experience.